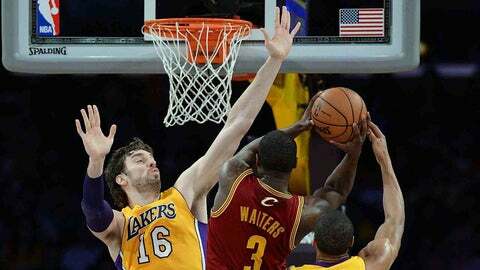 Jan 14, 2014; Los Angeles, CA, USA; Los Angeles Lakers shooting guard Wesley Johnson (11) and center Pau Gasol (16) defend Cleveland Cavaliers shooting guard Dion Waiters (3) in the second half of the game at Staples Center. Cleveland Cavaliers won 120-118. * This was a big one, because the Cavs can officially forget about Sunday’s 44-point loss at Sacramento. Instead, they can focus on the fact they’ve won three of four, including two of three on their five-game swing through the Western Conference. They’re also 2-1 with Luol Deng. At least the Cavs can forget about the 44-point loss to the Kings if morons like me don’t keep bringing it up. * Anyway, we saw what Deng can mean to this team. Man oh man, did we ever. The Cavs looked OK in the first quarter, then gave up a whopping 40 points to the undermanned Lakers in the second. The Lakers made 13 of 17 shots on their way to a season high for points in a quarter. And remember, the Lakers didn’t have Kobe Bryant or Steve Nash or Steve Blake or even Xavier Henry or Jordan Farmar. All were out with injuries. But they did have Jodie Meeks, and he scored 18 in the first half. * The Cavs trailed 63-57 entering the third. Then Deng sort of took over, helping the Cavs sprint to a 13-2 run to start the second half. Deng played with a great amount of energy on offense and locked in defensively. He was, in a word, huge. By the end of the night, he compiled 27 points on 9-of-15 shooting, including 5-of-5 on 3-pointers. The Cavs needed every last one of them. * At least as meaningful as all that? Whenever someone on the Lakers had the ball, and LA needed a basket, Cavs coach Mike Brown had to feel better if Deng was the man doing the defending. He is just so reliable, and has the type of winning mindset that is priceless for a young team. You could almost see Deng’s mind at work as he focused on stopping his man. "You’re not going to get a good look at the basket as long as I’m around," Deng’s expression seemed to say. * Brown also has to love hearing Deng echo his coach’s pleas for better team D. "Offensively, I don’t think we’re going to have trouble," Deng told FOX Sports Ohio afterward. * Deng speaks the truth, as he wasn’t the only reason the Cavs were able to overcome an 11-point deficit (then later hold off the Lakers’ late charge). Other Cavs who deserve plenty of credit range from Anderson Varejao to Tristan Thompson to Dion Waiters to Matthew Dellavedova to Kyrie Irving. * Varejao (18 points, a whopping 18 rebounds) just does so many things right — and it’s all the result of hustle and refusing to give up on plays. He and Deng seem to work very well together, too. Same goes for Varejao and backup center Tyler Zeller. Offensively, the Cavs were very much in sync, but without Varejao’s refusal to lose, it may not have mattered. * As for Thompson (15 points, 13 boards), it may have been his best showing of the year. At least, it was in terms of him putting the ball on the floor, making aggressive moves to the basket and finishing. And for as much credit as Varejao gets for energy (he deserves every bit of it), Thompson doesn’t get nearly enough. * The frontcourt was also responsible for 11 of the Cavs’ 27 assists. Varejao passed for six. * Then there’s the backcourt. Waiters really struggled in the first half, picking up three fouls in his first seven minutes. He scored just four points through three quarters, and it looked like it was just gonna be one of those nights. But he found his rhythm in the fourth, scoring 13 points and creating opportunities for teammates. * Most of that was Waiters’ decision not to settle for perimeter shots. He took the ball to the basket, drew fouls, and finished 7-of-8 from the free-throw line. * "The first half was kind of frustrating," Waiters admitted. "But I knew coach was gonna rely on me." * Or how about this: Dellavedova is the only Cavs rookie to not get drafted, yet he was the only one to get in the game. And the kid was clutch. In 20 minutes, he buried three big 3-pointers on his way to 11 vital points off the bench. 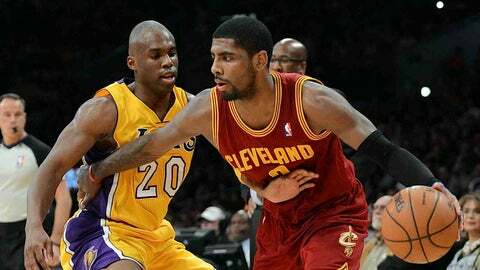 Cavs top Lakers in L.A.
* Irving (13 points, five assists) has certainly put forth better outings, but like Waiters, he spent much of the night in foul trouble. Still, Kyrie amassed some of those hockey assists (the pass that leads to the assist) that Brown loves. * That said, Irving hasn’t displayed his normal dose of pizzazz in the previous two games. He’s had moments of greatness lately, for sure. But overall, he’s been fairly inconsistent for a guy who’s likely to start in the All-Star Game. * Lakers guard Jodie Meeks, doing his best Kobe impersonation with 18 points in the first half, was held to just eight in the final two quarters. Part of that was because the Cavs showed him a little more respect. Part of it was because Meeks is a so-so NBA player. * I watched the game with Cavs legend and current analyst Campy Russell, and he looked at me before the start of the third quarter and said, "No way the Lakers can keep shooting like this, right?" He was correct. Mike D’Antoni’s team lives and dies with the perimeter shot. In the end, that usually results in die. Or in basketball terms, lose. * Still, it wasn’t over until Nick Young (28 points) missed a three near the end. Young is the NBA’s top-scoring reserve, and he was fantastic on this night. ""He’s a tough cover," Brown said. "He’s so herky-jerky, he keeps you off-balance." * The Cavs were hoping to keep Deng on a minutes limitation because of his sore Achilles. That idea was scrapped Tuesday, with Deng playing a team-high 38. "What minute-limit?" Brown asked, smiling. "We’re trying to win a game, baby. I might get reprimanded, (but) I’ll think about it later." * Bottom line: It wasn’t the best win ever, as the Cavs surrendered about 30 points more than Brown would like. But he’ll take it. "We found a way to get a win on the road," he said. "For us, that’s a positive." * Finally, Brown became the first ex-Lakers coach to win his first game back in LA with another team since Butch van Breda Kolff did it in 1969.